While MGM clearly searches for solid ground, Darren Aronofsky’s RoboCop reboot has stalled, according to MovieHole. The essential crux of the delay is that Mary Parent, Chairperson of MGM, seems to want the film in 3-D.
We have James Cameron’s massive success with Avatar to thank for that, though it isn’t entirely his fault that he successfully launched a franchise on the back of an extra dimension. Bringing an alien world to life in 3-D makes sense, but a film like RoboCop might not. In fact, it is Aronofsky that appears to be against the change. To find out why and the possible future of the re-imagining, hit the jump. “I’ve spoken with Phoenix Pictures [and] asked them about the status of Robocop… they told me that the project is on hold. The problem is that Mary Parent, Chairperson of MGM, wants a 3D movie for the new Robocop. But, as you know, Darren Aronofsky is a real artist and he’s not interested in gimmicks like, 3D, CGI, filming digital, he wants to do everything as real (organic) as possible just like The Fountain”. While this might appear to be a recipe for development hell, the awe factor of Avatar‘s success should soon fade and what will be left is the realization that 3D requires a significant investment-one that demands a significant return, as well. That isn’t to say that Aronofsky can’t make money with this film, but his approach might not lend itself to a massive box-office draw-whether the film is good or not. Aronofsky and writer David Self (Road to Perdition) are not planning a remake of the Paul Verhoeven film, but instead an entire reworking. Fans of Aronofsky know that he can handle the science-fiction genre well, as evidenced by The Fountain. 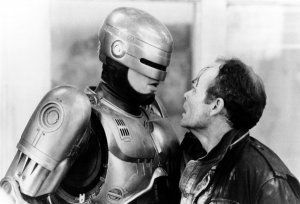 However, his vision for RoboCop might completely alienate fans of the series, as the film will be entirely unrelated to the original’s storyline. Where Aronofsky and Self will head is anyone’s guess, as both have been tight-lipped. Despite this, Aronofsky seems to be a good match for rebooting the series. The original Verhoeven film was gritty and raw, grabbing and R-rating and mixing in his typical undercurrent of satire. For Aronofsky, Requiem for a Dream is the perfect example of how far he is willing to go and shows that, if nothing else, he will bring an interesting take on the franchise. As it stands, the film has been pushed back from a 2010 release to 2011, showing it is on shaky ground. Whatever is in store for RoboCop, it is hard to imagine 3D being a saving grace.